June 2018 – Münster University Hospital has commissioned MMI Schweiz AG to review and further develop the infrastructural master planning, which regulates the renovation measures of the hospital area for the period until 2025. 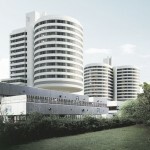 In this context MMI created the medical concept for the hospital and a new Operations Center (OPZ). Furthermore, MMIs experts have developed the space and operational program for the OPZ. The new building should be completed by 2021. This planning was based on a comprehensive data analysis of all relevant clinical data in the context of the current market situation. The aim of the hospital is finally to consolidate thematically related facilities into higher-level functional areas in order to be able to offer more efficient and cost-effective patient care in the future.